Home » DIY And Crafts » Where’s My Hammer? I bought this galvanized toolbox at a yard sale a couple years ago. It makes a great little planter to just toss in the garden any place you need a pop of color. And it’s small enough that I can just pick it up and move it somewhere else if I want to. Once my calla lilies pop out in full bloom, I’ll be moving this to another barren area of my landscape. I did drill holes in the bottom and in the top of the toolbox, so it wouldn’t hold ridiculous amounts of water. And the flowers are from a hanging basket that I took out of the basket and plopped in here (hanging baskets are on clearance around here and ridiculously cheap). Instant color. Hardly any money. Happy girl. So what are you up to this weekend? I have not been to one single itty-bitty yard sale. Not one. Dying here, but I’ve been working on spring cleaning my house this last week and I can’t bring one more thing into it until I organize what I have. And yes, I am fully aware that it is summer, not spring. I’m a little behind on my household chores that I love so much. So get out there and buy some good stuff. I’m counting on you to take up the slack for me. I love the toolbox planter. I scored a couple of beat up galvanized pails for $2 at an estate sale yesterday. Have fun cleaning! I hope hanging baskets are on clearance here, because the flowers in my window box have bit the dust. Yours look pretty in your tool box and I can’t wait to see your calla lilies in bloom! You have just inspired me to plop a cheap hanging basket in the middle of a spot we haven’t planted yet. Yes, the toolbox is precious! You have inspired me to go hunt around in my husband’s garage. He never throws anything away! LOL! 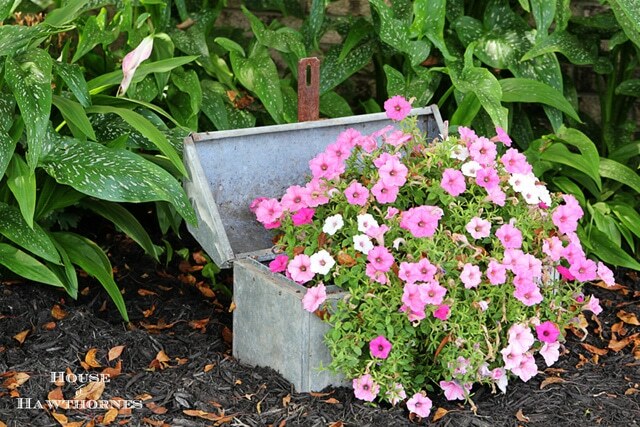 The pink petunias in the silver toolbox are fabulous! Pam I can’t believe what great timing for me. I just found an old red tool box at a thrift store and bought it without any idea of what I was going to do with it. I never thought about drilling holes for water and putting it in the garden. Perfect! That is awesome! Never would have thought to use a tool box absolutely love it!!! Sorry. I’m in purging/organizing/cleaning mode as well. Love the little container filling up bare space. I love your toolbox full of Petunias! I need to shampoo the carpets…and that was the plan…until the news said it could be 100 degrees. Now I just want to lay around and drink iced tea! We found the Garage Sale – you know the mythical garage sale that has lots of amazing stuff super cheap and no one else is there to steal all the goodies. I spent $40 this weekend and came home with some serious treasures. I’ll be blogging about them tomorrow you’ll have to stop by. I love the way you use your tool box. Very clever! Another brilliant transformation and I especially love how you used a hanging basket to fill up that container. Cute galvanized container. I never drill holes and they always have water in them and drown. I have been junking for you-don’t fret. Thanks so much for linking up to our “Best Of The Weekend” party! I have also pinned this to our BOTW party board and to another big board of mine! Looks great…cool galvanized tool box!! Using a toolbox as a planter is a great idea! I’m pinning this and will share it on my FB page. When my mom sees it there, she’s sure to love it and make her own.